Joan asks whether Cynthia can do her a favour with regards to Ruth in Blackmoor. Dennis arrives home to find Meg has company. Terri is credited to Margot "Night". Officer Radcliffe and the Gate Guard are not in this episode. Terri arrives at Joan's house and sees smoke billowing from the roof . A neighbour armed with a pickaxe tells her he has phoned the fire brigade and he's just going to break in to "save a few things". Joan is found unconscious lying in her hall and is taken outside. The women have somehow heard about Frank's escape, but most of them haven't heard of him: Ettie remembers that he raped Pixie and Lou adds that Frank was fixed by Myra lagging on him, so they shouldn't be turning her into a saint. Nora responds that Lou herself had been doing a bit of lagging herself recently by talking to the police about her shooting the terrorist. Frank hitches a lift with a woman driving a truck. Joan is told that the fire was in her kitchen: she says it must have been a deliberate attempt to kill her. Frank pulls a gun on the woman who gave him a lift and forces her to drive the truck off the road (passing a "ROAD CLOSED" sign that is headed "City of Knox" ). Terri insists Joan moves in with her, even though Joan tells her it is dangerous for her. Joyce and Mervin settle into their new flat and have a good old bicker when Joyce refers to "her" kitchen. The Council vote for Nora as their representative at Myra's funeral. Joan phones Fellowes to offer him a deal, but he won't hear of it. Frank finds a phone booth with a phone book intact (those were the days!) and rips out the page listing the Cruickshanks. As Dennis leaves for work, Frank is watching the flats from a plumber's van he seems to have stolen. Terri urges Joan to go to the police if her life is in danger. Frank phones the prison and Officer Slattery gives Dennis's flat number when he says he already knows the rest of the address. Julie drops a stack of plates when Ettie swats a fly with a wooden spoon and it sounds like a gunshot. The police don't take Joan's complaint seriously and say they don't have the manpower to put a guard on her. Fellowes sends his incompetent henchman out again and tells him not to come back until Joan is dead. Daphne is to see Dr Weissman: Sister Hall suggests PMS as a possible reason for her erratic behaviour and blames the doctor at Barnhurst, who doesn't believe it exists and therefore wouldn't have diagnosed it. Joan surprises the women by returning to work. Nora challenges her with her failure to kill Ruth and reminds her of her debt to Myra. Daphne starts piano lessons with Jenny. Frank breaks into Dennis's old flat. 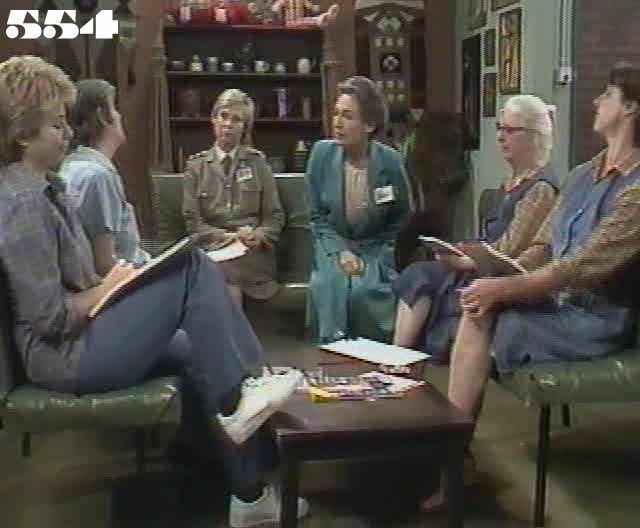 Ann meets the Council, with Nora and May sitting in for Julie and Myra: she promises to make their views known to the Department, but in return they are expected to keep control of troublemakers. Lexie asks Ettie to lend her some money so she can give Joyce back the money she stole from her. Mrs Goddard comes to visit Jenny and tells her that George the gardener had seen ladder marks under the window the morning before Mrs Hartley was killed. Jenny begs her to take George to the police and repeat his story. While the women are on exercise period, a sniper takes a number of shots at Joan in the garden, but misses. The police still don't seem to want to do much about it, so Joan phones her friend Cynthia Leach at Blackmoor and asks for Ruth to be roughed up. Frank realises he has the wrong flat and sneaks out while Joyce is busy unpacking. Jenny tells Ann about Mrs Goddard's visit. Dennis comes home to Meg: he notices she is acting strangely and looks up to see Frank is pointing a gun at her. Frank helps us settle how Dennis' surname is spelt when he looks through the phone book , though he ends up pointing at the Js rather than the Ds. Mark Caffrey comments: "When Joan arrives at Terrie's place, we can see the same print hanging on the wall that Ruth admired in Ann's office in a the classic 'I do think I've been a model prisoner' scene from Episode 543."